Comfort Food Recipes – needed now! All around the UK, Comfort Food recipes are needed right now! If it’s not rain and floods, it’s snow or landslips or total demolition of our transport system. Dare I say it – but in East Yorkshire it’s not been too bad. Mind you, we had the floods and landslips and rain and coastal erosion before Christmas, but for some reason it wasn’t that widely reported in the newspapers or on the TV. Wonder why? Oh yes. This is the north of England, and of no importance to most of those in charge down south. But never mind that – we’re all in it together. Let’s provide some succour, some comfort food recipes to warm you all up, and give you some hope that someone, somewhere will think up some sensible answers to these problems. First of all, a wonderful comforting dish (maybe not for the waistline, but we can jog that off when the weather is better). From a chef proud to be a ‘Yorkshire lad’, James Martin. The Tartiflette dish is definitely a Comfort Food recipe. If you've been skiing, you've probably discovered it already. Perfect food for after a very cold (or damp) day. This recipe is from Slow Cooking from James Martin, and also is found on the Good Food Channel. Hope you enjoy it - that it fills you up and gives you some comfort. Preheat the oven to 180C / fan 160C / Gas mark 4. Place the potatoes, unpeeled, into a large pan, cover with water and bring to the boil and cook for 15 minutes. Melt the butter in a heavy-based pan over a low heat, add the onion and bacon and cook gently for 10 minutes, stirring occasionally, until softened but not coloured. Drain the potatoes and let them cool a little. As soon as you can, peel them and cut into slices around 5 mm thick. Grease the inside of an ovenproof dish or baking tin then cut the garlic clove in half and rub the dish or tin with it. Place some of the potato slices over the base of the dish, season with salt and pepper and sprinkle with some of the bacon and onion. Keep layering the potatoes, bacon and onion and continue until all the potatoes have been used up, seasoning with salt and pepper between each layer. Trim the sides of the petit reblochon cheese all the way around, removing about 5 mm of the skin. Place the cheese on the top of the potatoes and cover tightly with foil. Bake in the oven for 1 hour, until the potatoes are crisp around the edges and the cheese is well melted. remove the foil and cook for a further 15 minutes, or until it is just crispy around the edges. Serve on its own, or with a dressed green salad. 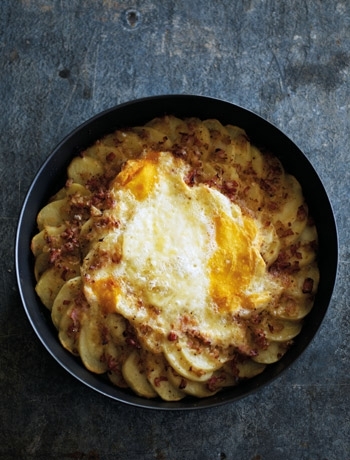 I just love the look of the Tartiflette recipe. It just oozes comfort and utter deliciousness. Being rich and cheesy, I find it definitely needs something like a crunchy green salad to cut through that richness. Or a red cabbage sliced thinly into a winter coleslaw, with dry-fried walnuts to give it some crunch. The next Comfort Food Recipe is by Donna Hay. This is a frittata, and as suggested, is ‘full of hearty flavours.’ It can be served hot, with crusty bread for brunch, or with some crunchy green vegetables such as french beans or Tenderstem broccoli on the side. This Chorizo, Spinach & Ricotta dish is, again, a comfort food recipe, but a much lighter one than Tartiflette. You can add more to the Fritatta to fill it out such as pre-boiled new potato slices, onion slices and mushrooms. The list is endless. 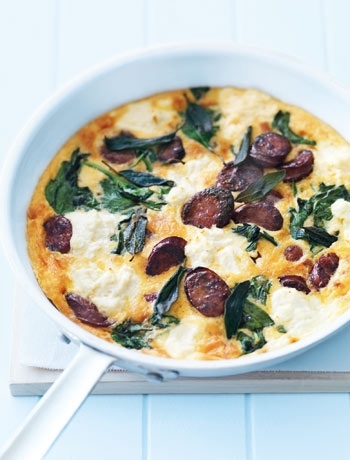 But if you just want a quick, comforting dish, this Frittata is perfect. Heat a 22cm non-stick frying pan over medium-high heat. Add the chorizo and sage and cook for 4 - 5 minutes or until the chorizo is golden and crisp. Add the spinach and toss until wilted. Whisk together the eggs, cream, salt and pepper and pour into the pan. Place spoonfuls of ricotta around the pan, reduce heat to low and cook for 3 minutes. Place the frittata under a preheated hot grill, and cook for 2 minutes or until frittata is just set and golden. If serving for brunch, serve with thick slices of hot buttered toast or crusty bread. If serving for lunch or a light meal, serve with crusty vegetables. I’ve suddenly realised that I’ve been adding lots of savoury food recipes recently – I think it’s time I gave you some sweet comfort food recipes next, so keep looking out for these. Get your tastebuds ready!